Pulled Chicken Barbeque: Tender, Easy and Tasty! My kingdom for a simple but tasty gluten free pulled chicken barbeque recipe! Well, maybe just a hearty thanks: to my friend Niki for her recipe inspiration. This is so easy, only a few ingredients and fantastic results; it is a slow cooker recipe; the perfect method for effortless, falling apart and mouth watering barbeque. Mix it all in the slow cooker and four hours later it is ready, no sweat, no mess and the kitchen isn’t much warmer despite making this great dish. If you hate dark meat; make it with chicken breast; will be done in less time of course; maybe 2-3 hours? For a change I bought some gluten free roll made by Schar; their classic white rolls. The package says new recipe and they are much better than I thought they would be. Each held their shape, decent flavor: fantastic full of barbequed chicken thighs. I also had a burger in one of the four buns and it held together nicely. Schar has occasional coupons; I used one I got on line when I bought them for this meal and ended up paying $.50 a roll which is really cheap for gf rolls. One third to half a bottle of gluten free barbeque sauce; Sweet Baby Ray’s is the barbeque sauce I use these days, nice smoky tang to it. I think you could easily double this to 5 lbs of chicken. I am planning to make it for my next summer gathering; just so easy and the no grill, no oven, no fry is awesome for summer meal planning. 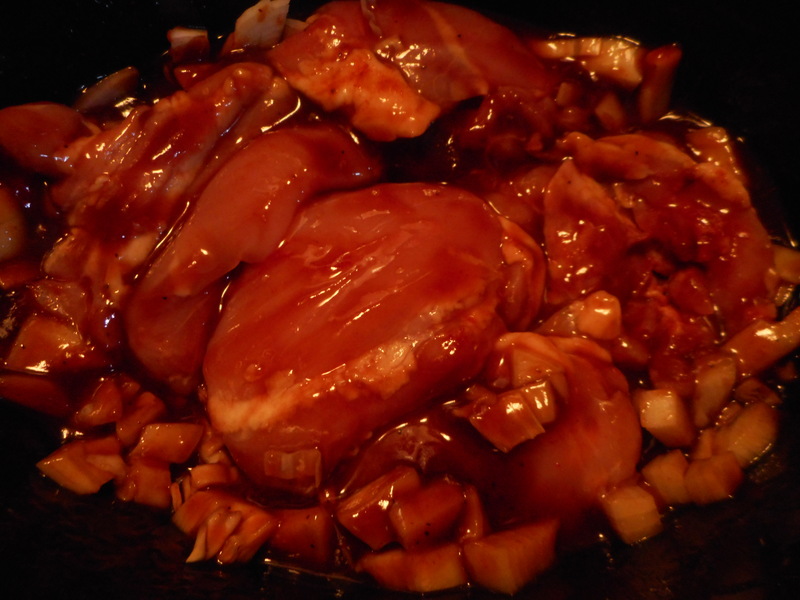 Dump all but chicken in the slow cooker, stir, add chicken thighs; skinless is my preference. Cover and cook on high for 3.5 to 4 hours. 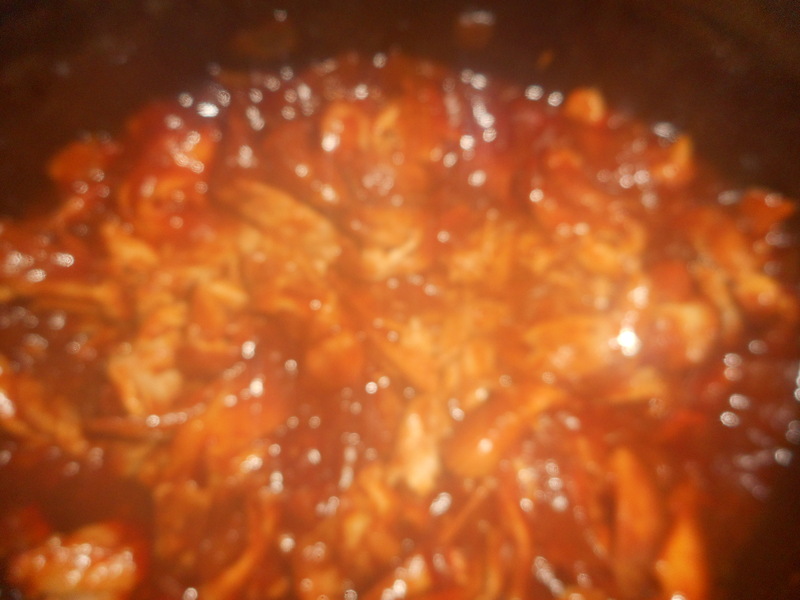 If you are around stir it once half way though and flip the chicken over. When done, turn off the slow cooker and break up the meat while still in it: I used a wooden spoon. Serve in a bun: mine was Schar’s classic white. Use what ever bun you like! And of course, I used gf barbeque sauce. Be sure it is a quality sauce you are fond of or the results will not be happy! Just like cooking with wine; use ingredients you would enjoy all on their own. This recipe is a home run on a busy summer day. Pair it with a salad or two and you have a great meal for four; double it to serve eight. 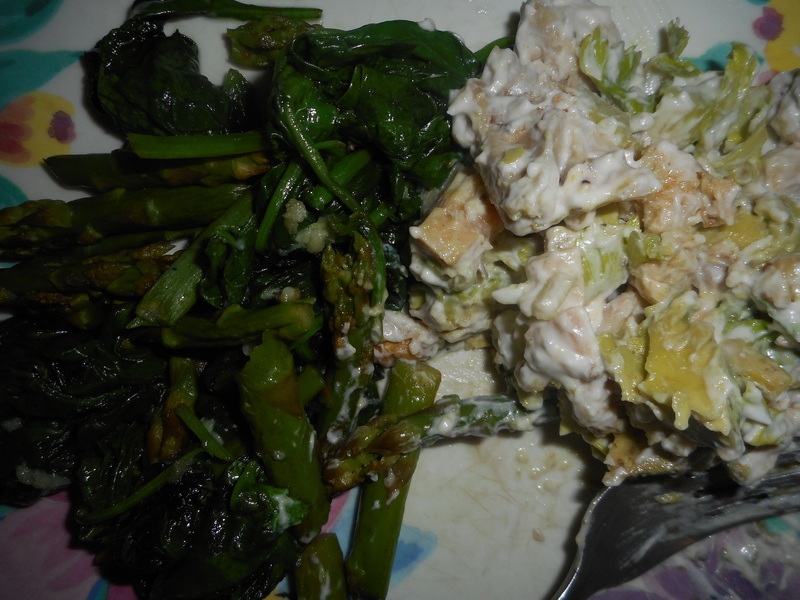 Chicken Salad, Two Ways…Too Delish! 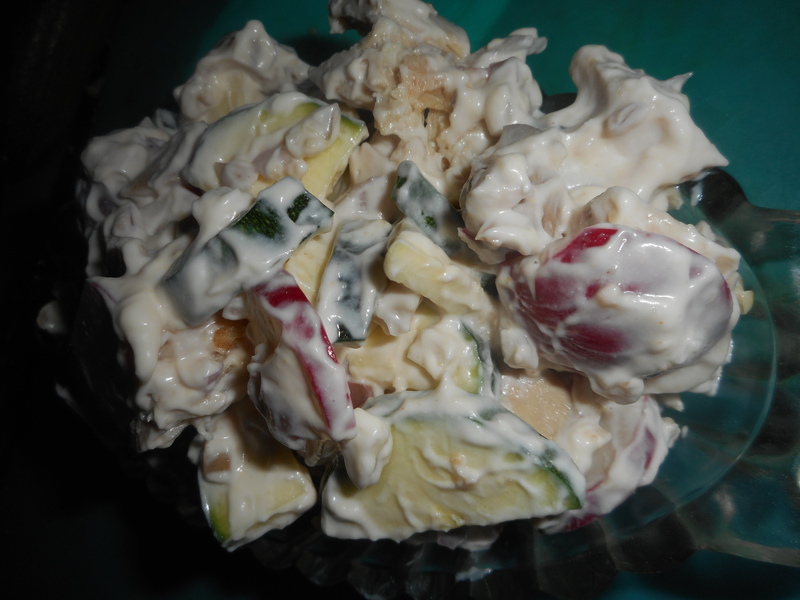 Chicken salad is a pleasant meal on a hot evening. Cool, easy to construct and it can be varied in many ways. I made two new versions in the past week or so and wanted to share them. The chicken was some oven roasted chicken thighs I cut up cold for the salads. Use whatever kind of cooked chicken you prefer. 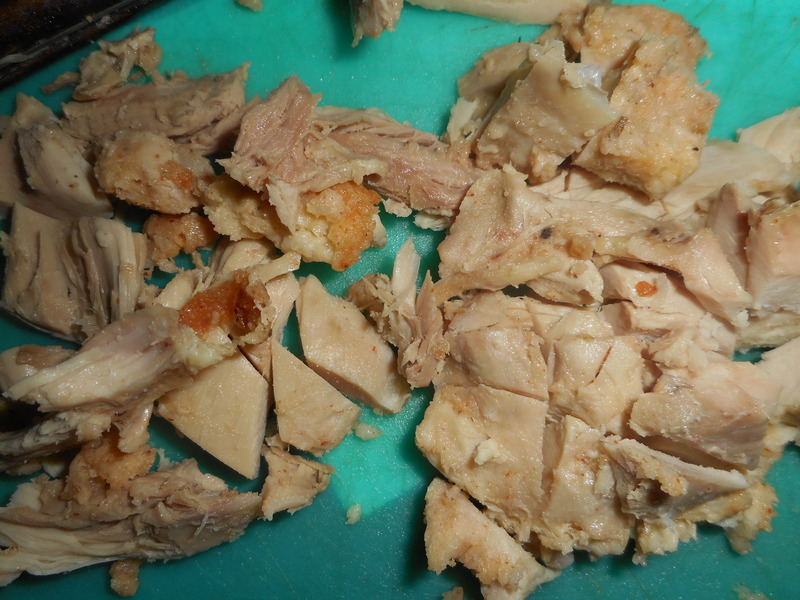 If you buy rotisserie chicken be aware that most is not gf; ask or check online. It can be so convenient on a hot summer day but be sure it is safe for you. For those of us with celiac disease, spice blends sometimes contain wheat flour and also some rotisserie chicken is coated with spice blends mixed with flour. I think Costco has gf rotisserie chicken. I like fruit, particularly grapes, in my chicken salad but I didn’t have much on hand so I went with what produce was in the fridge. I often have mine with lettuce, I am guessing it would be great on gf toast if sandwiches are your preference. 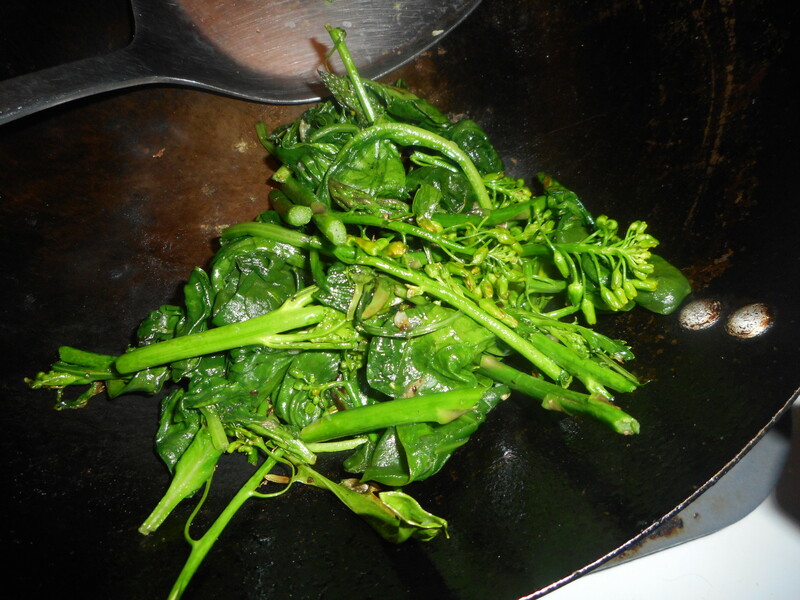 This week I served sauteed spinach with asparagus as my side dish; no starch; makes all my low carbing friends extra happy. Last November I posted a similar recipe – actually turkey salad but it would be tasty made with chicken. It was the classic style with grapes and walnuts dressed up with an addition of avocado slices and pomegranate seeds. Hard to find those ruby seeds right now but blueberries might make a great substitute. Directions; cut everything up. Place the mayo, vinegar, mustard and salt/pepper to taste in a mixing bowl; mix. Add the rest of the ingredients, stir gently: you don’t want to mush up the avocado. Serve with fresh loose leaf lettuce. 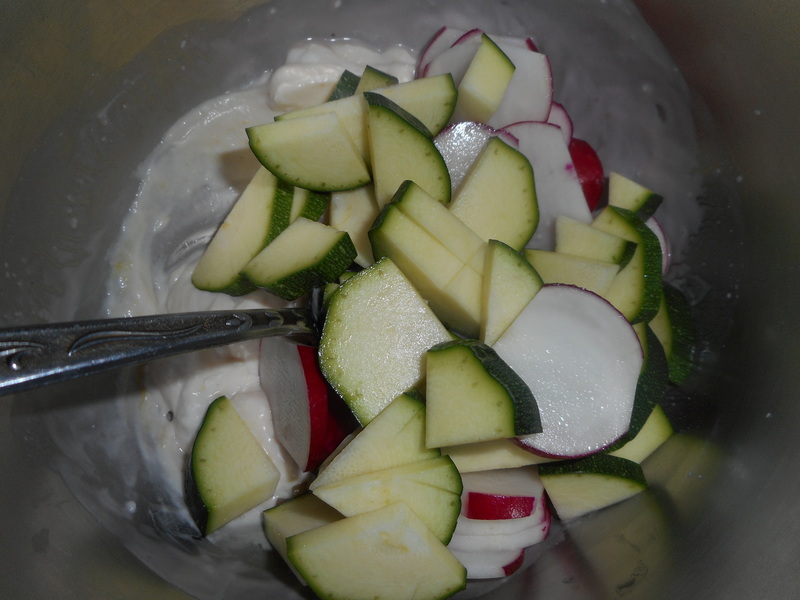 Chicken Salad Variation 2 – I used cherry radishes and raw zucchini but you could use any veggies you enjoy. Directions; cut everything up. Place the mayo, vinegar, mustard and salt/pepper to taste in a mixing bowl; mix. Add the rest of the ingredients, stir to mix. Serve with fresh loose leaf lettuce. Notes: you could use 2 smaller thighs if that is what you have and the dressing mixture is fluid; can use more or less mustard, vinegar, and mayo; spicer with more mustard plus some like the mixture almost dry and others want a moist chicken salad. Enjoy it in an avocado half or in a hollowed out tomato for a fancy luncheon entree! 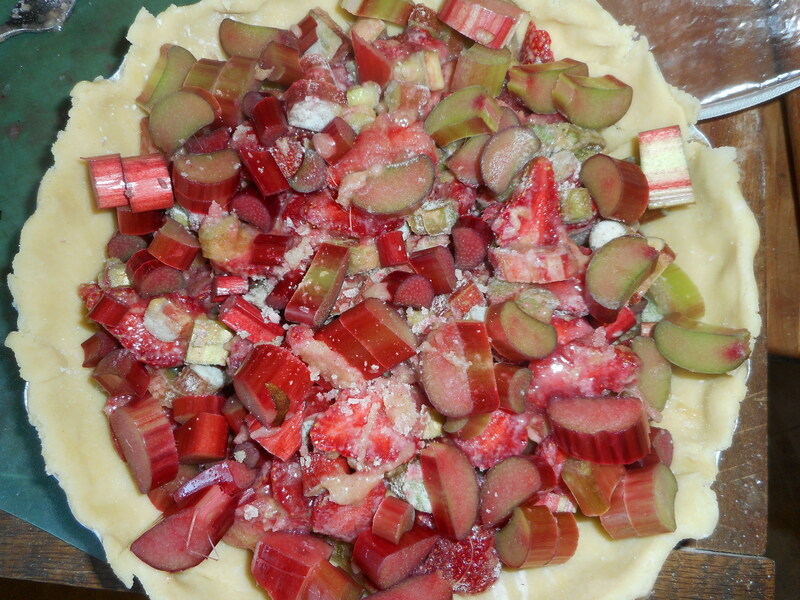 It is the start of local strawberry season and rhubarb is plentiful right now so this was a perfect pairing for adaptation to a gluten free pie recipe. This is an easy pie to construct and you can store any leftover crumb mixture in a sealed container in the fridge; it keeps a few weeks. The GF crust will work for any pie and the GF crumb topping is perfect for any crumb pie. If you prefer a solid crust just double the crust part and top your pie with it. Be sure to cut some slits for steam escape! I have a second oven; I call it the pizza oven which I use mostly to bake pies in; it has only bottom heat. This gives my crust the chance to get properly browned without overcooking the rest of the pie. If you use a regular oven you might want to prebake your empty gf crust for 10 minutes to give it a head start so it doesn’t get underbaked. If you are making this pie with regular flour; just sub in for the gf blend and bake it as I describe below. I made this pie before I went gf and if you are a gluten gluten you can still enjoy the berry goodness of this late spring themed pie. 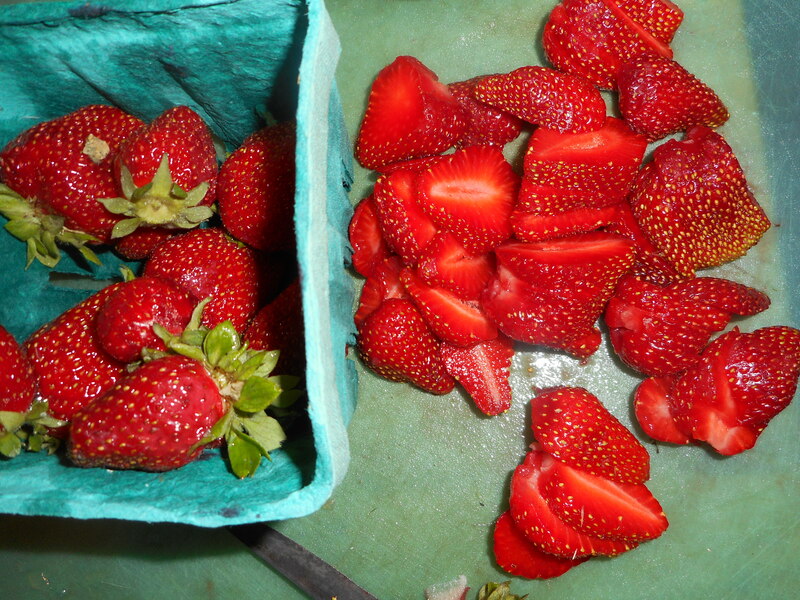 Please make every effort to use local strawberries; you can get them at most farm stands, farmer’s markets and at Lehigh Valley Produce on Main Street in Hellertown. I got mine at Lehigh Valley Produce; very flavorful and in prime condition. 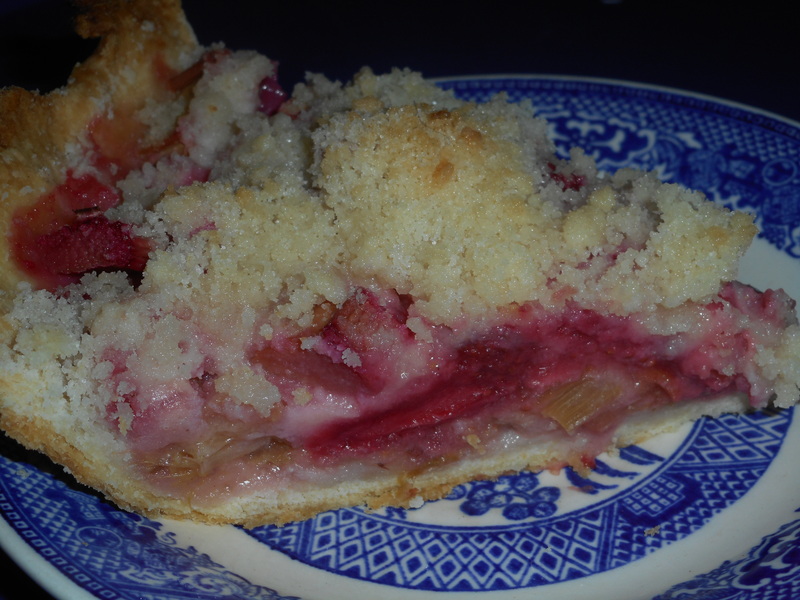 This pie really showcases the strawberries more than the rhubarb which is a silent partner so that is why I suggest you get the best; locally grown sweet ripe strawberries to make your pie’s flavor just perfect. Bake and enjoy early summer in a pie from just a few minutes of work. Don’t eat it hot; it should be cooled to room temperature or even chilled. I am guessing you could top this with vanilla ice cream. Maybe next time! 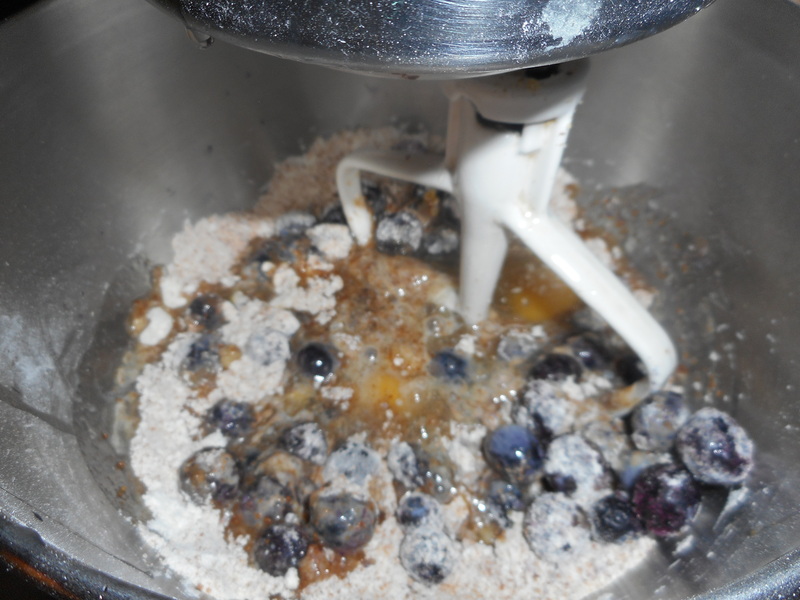 Mix dry ingredients in bowl of stand electric mixer. 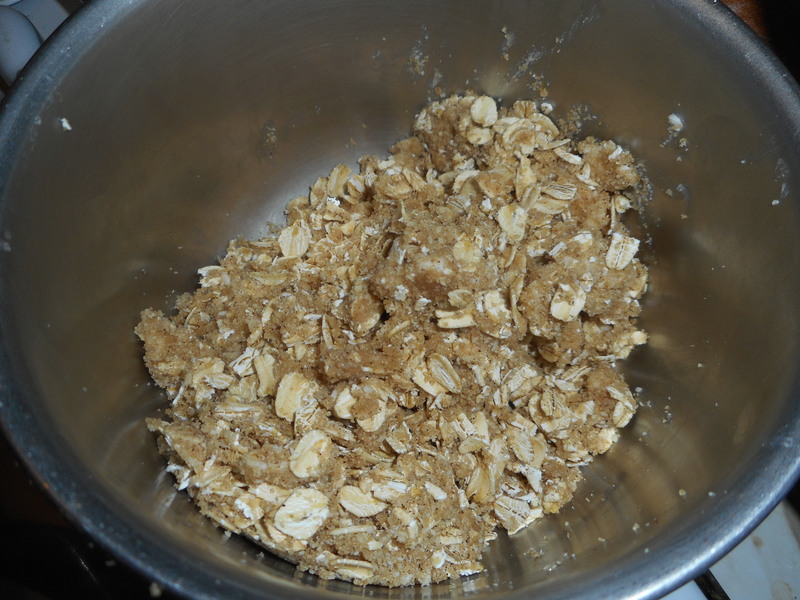 Add butter and mix until crumbly and resembling coarse meal. Add egg and juice. Mix until it comes together into big chunks. Shape into a ball with your hands. 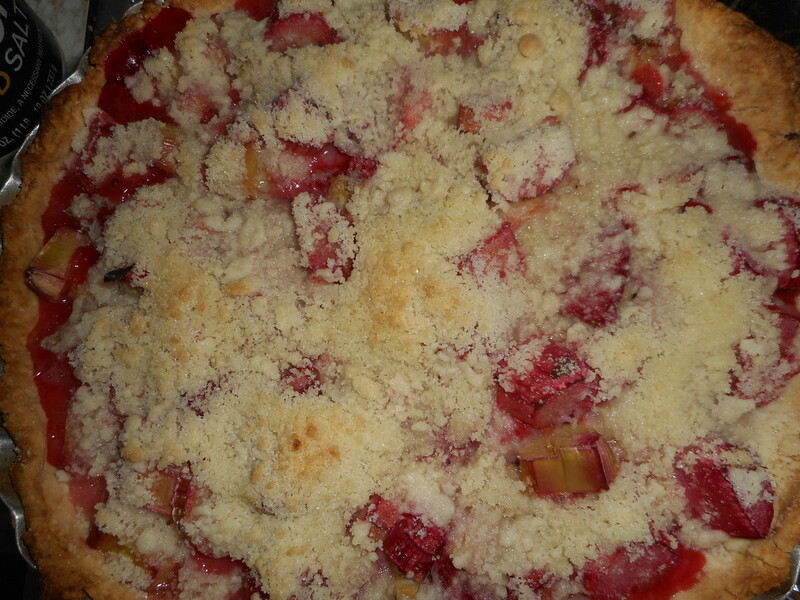 Put it on a crust sized piece of wax paper (14 x 14 inches more or less), flatten the crust ball some; put on top of it another piece of wax paper and chill it all in your fridge 15-20 minutes while you chop the rhubarb into ½ inch chunks and hull/slice the strawberries. Roll out pie crust in a pie bag or between the two sheets of wax paper, try to get the thickness even, no thick middle! Peel off one side of paper and place in pie pan, centered. Remove other slice of wax paper. Crimp edges all around. 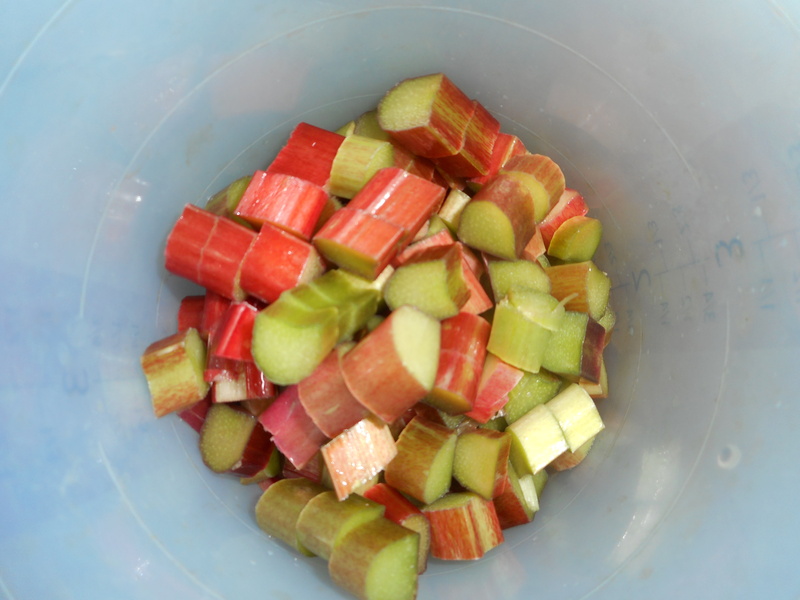 Fill with dry strawberry – rhubarb mixture. Beat egg in a small bowl and pour over. Top with crumbs. Sprinkle the top of the pie with crumb mix; use as much as you like. I like about ½ to 2/3 of the mixture. Up to your personal taste… It sinks partially into the fruit mixture and adds lots of sweetness and eye appeal. Bake in a preheated 425 degree oven for 40-45 minutes until bubbly and the crust is light brown. Cool at least 2 to 4 hours before serving at room temperature. 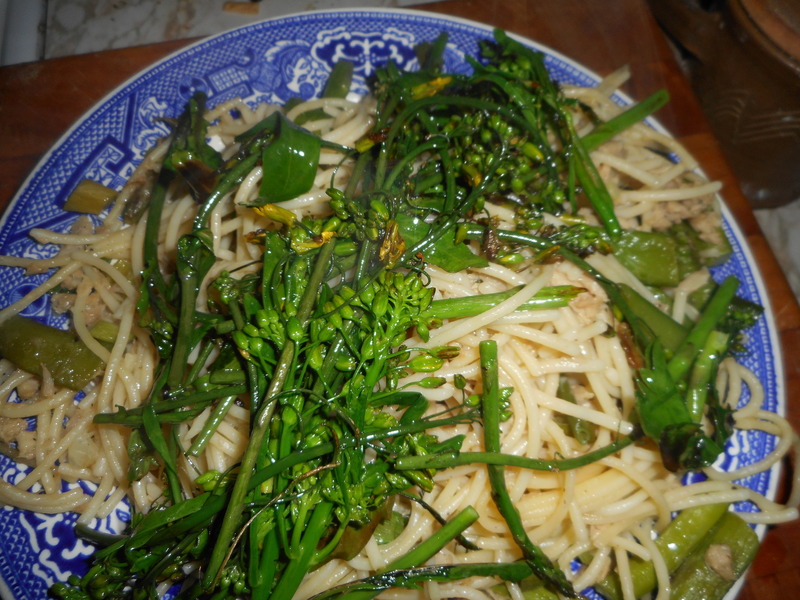 Tis the season for asparagus, spring onions and sugar snap peas. I love them all served together with spaghetti and garlic and lots of butter. This is the only seafood and pasta dish where I grate cheese on top; normally taboo – considered not a good combination but it works fantastically in this fast to throw together entrée. 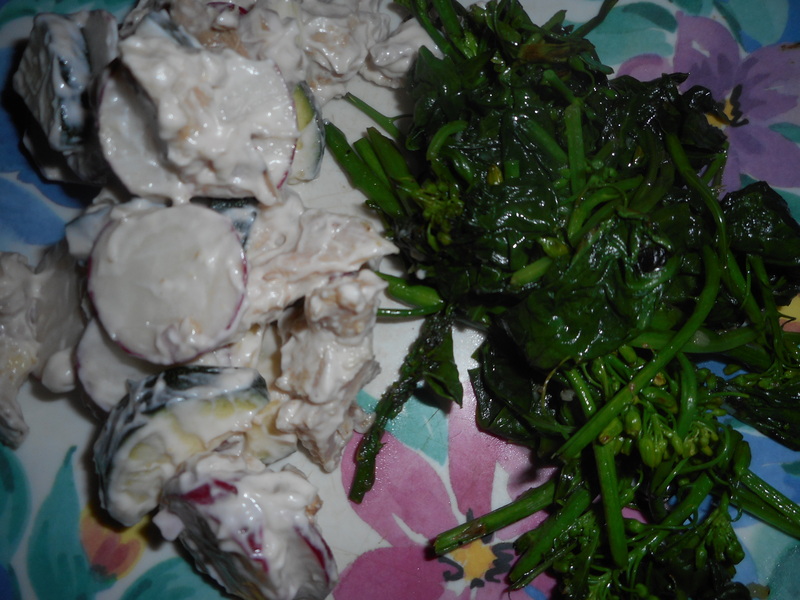 This meal is visually appealing with the greens and the white. I have been making variations of it for many years. This is one of my favorite versions. 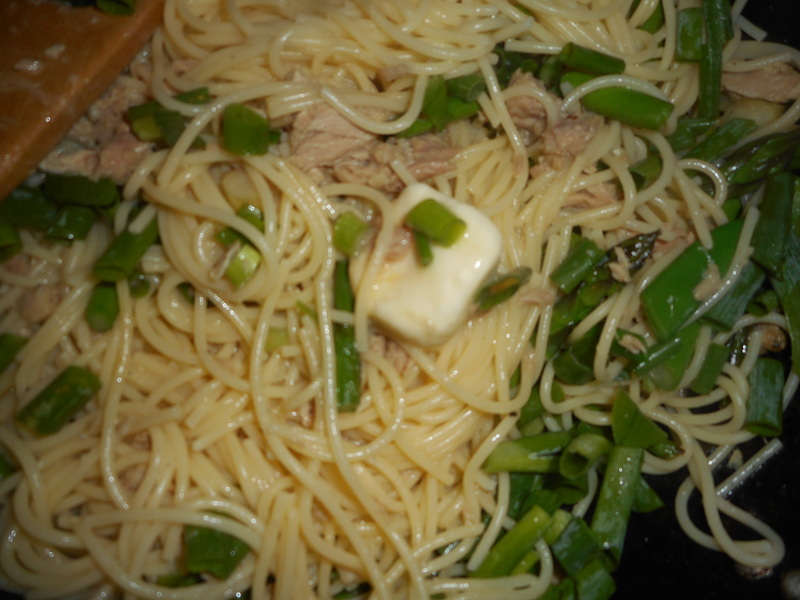 Great flavor and so speedy to make; how fast can you get the water boiling and cook the pasta? That is how long it takes to create a great meal in one fantastic dish. Yes, I make it with gf pasta. Use the brand you love, don’t overcook it; barely done is best. I made it for years and years with regular pasta before I had to go gluten free. The original recipe didn’t have the asparagus and peas; my addition. Good no matter what veggies you add; just don’t take away any of the basic ingredients. 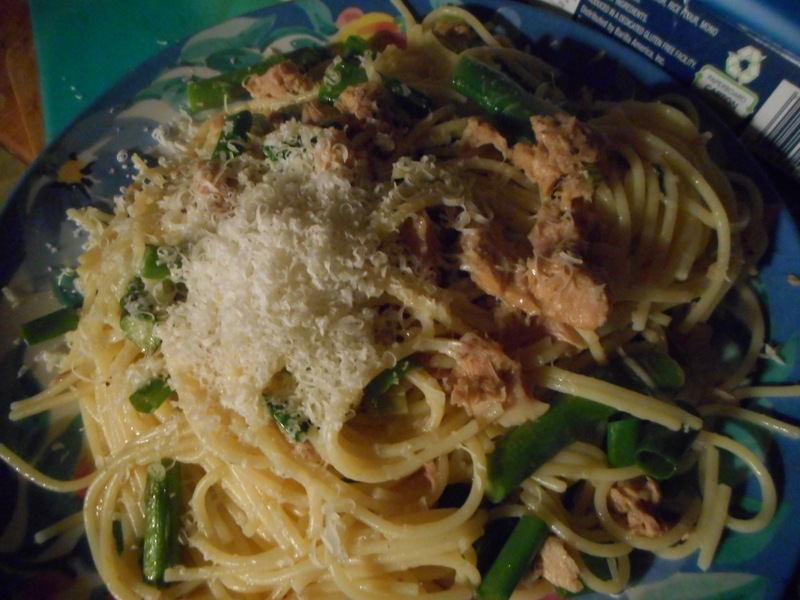 Be sure to use tuna packed in olive oil; makes all the difference, especially for Italian dishes, much better flavor than any other kind of tuna. Giant carries it as does Wegmans. If you totally hate tuna you could use half a pound of small cooked shrimp. Ditto on using real butter, margarine will ruin the flavor for sure. And I really love the greens; especially the onions; buy scallions if you can’t find spring onions. 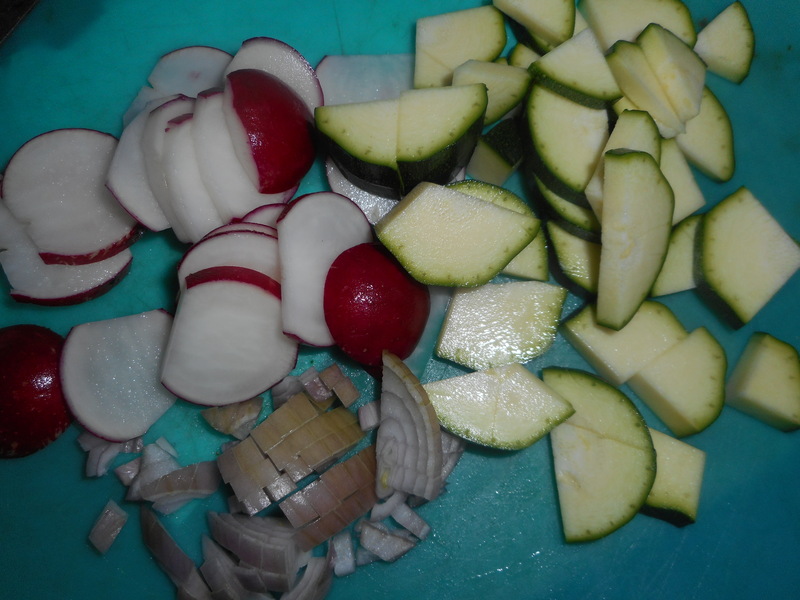 I always cook the white parts a few minutes but the green tops can be close to raw. Better that way than overcooked. Last but not least by any means, use the real deal for your parmesan cheese, that shreddy stuff in the jar is not gf a lot of the time and the flavor is sad when compared to a chunk you just grated on your pasta. You can thank me after you taste this masterpiece! Directions: Boil a big pot of salted water, add the entire box of spaghetti; usually 12 oz size in gf. Cook stirring often until barely done. Drain. While it cooks make the rest of the dish. 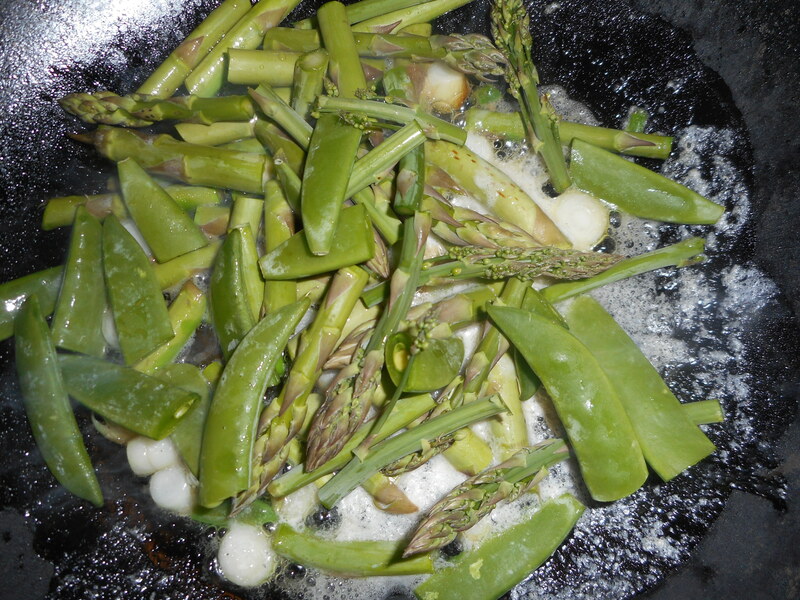 Veggie Prep: I like to snap the asparagus into manageable lengths; like 1 ½ inches long. Ditch the tough ends. Cut the peas in half, cut the spring onions into ¼ inch rounds. Melt 3 tbsp. of the butter in a big saucepan. I use my mini wok. Add the veggies, cook a minute, and add the garlic pressed or minced. Stir and cook another minute. 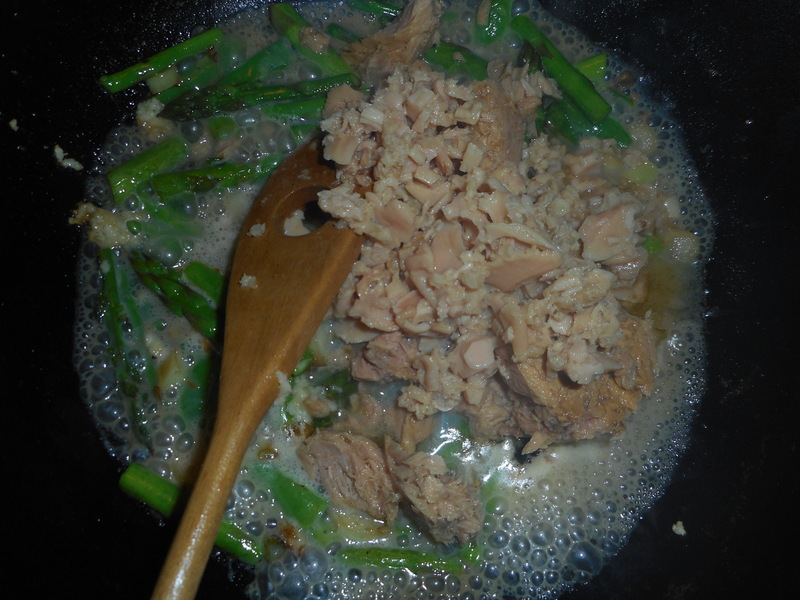 Throw in the white part of the onions; add the tuna and clams with ALL the juices and olive oil in the tuna can. Stir gently and cook a minute. 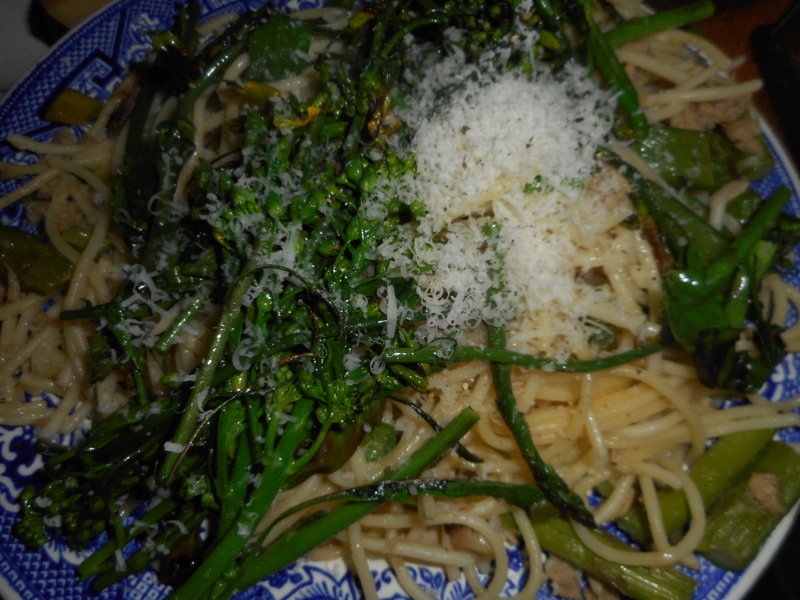 Toss in the green parts of the scallions and the cooked hot pasta. Stir a bit. Add 1 tbsp. more butter if you dare and up to a quarter cup of pasta water to moisten the pasta. It is really not a wet sauce; the stuff should cling to the strands of spaghetti. Serve and top each portion with a healthy amount of finely grated real parmesan cheese. Should serve four but if you are piggy only serves 3! 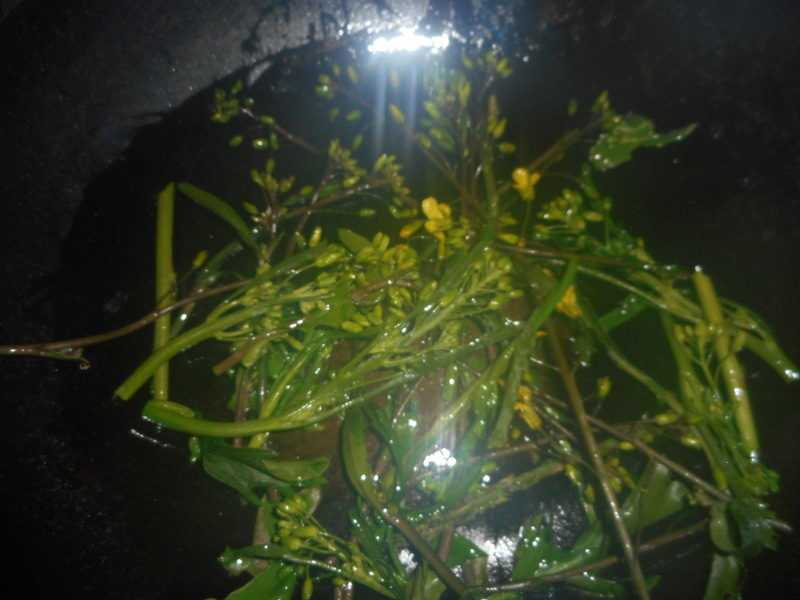 Yes, you can eat kale flower buds, a lot like broccolini. I sometimes blanch them in hot water before sauteing with olive oil and garlic. 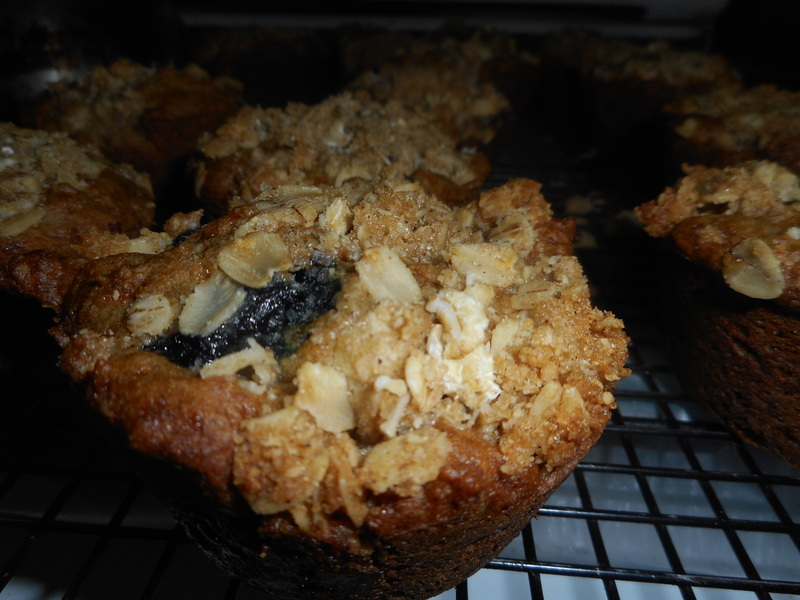 Blueberry Crumb Muffin – Bluedelishous! 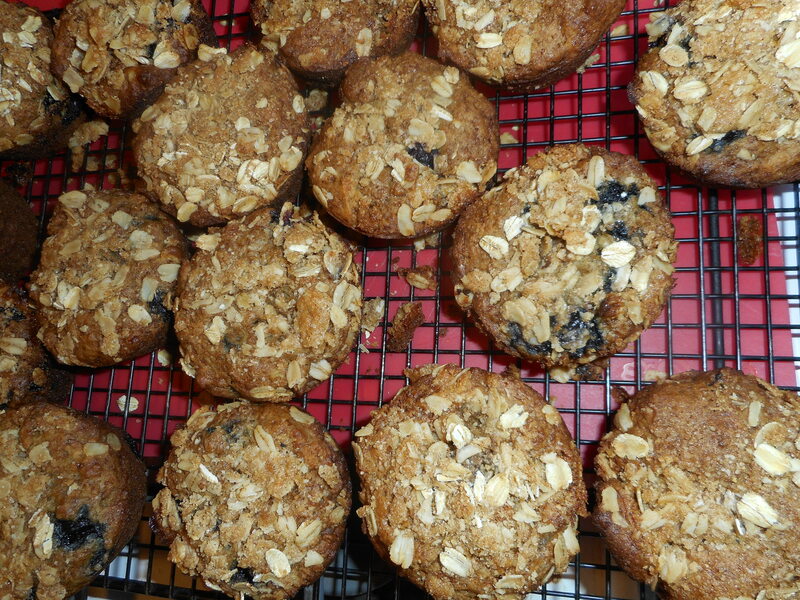 Oh….the muffin saga unfolds further…what flavor shall I make for snack time? Turning to my trusty muffin recipe I went for a classic: blueberry crumb. So easy: think I can almost do it in my sleep! That’s why the basic muffin recipe is my go to baked snack. They are always tasty and far cheaper than GF muffins you can buy. 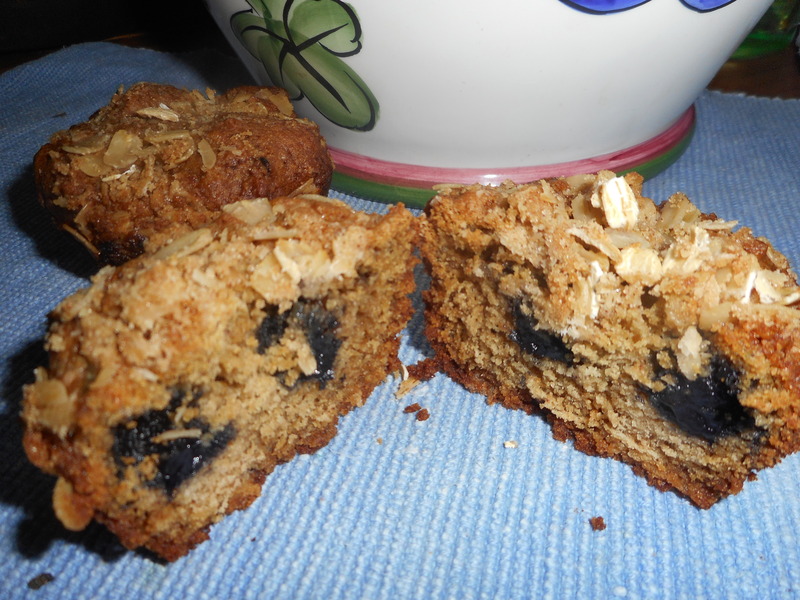 This batch of muffins was delightful: delicate texture yet slightly crunchy outside with the sweet blueberry flavor and just enough sugar for me. 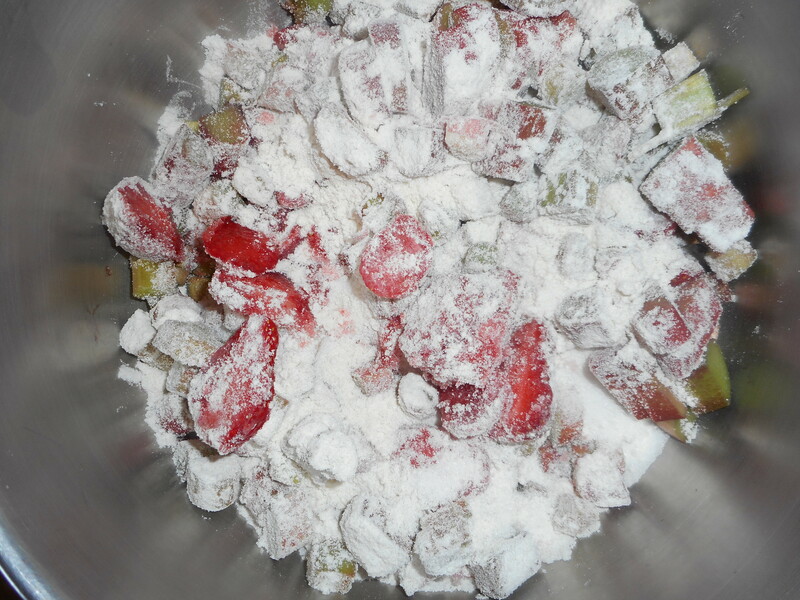 I used a bag of fruit straight out of the freezer -don’t defrost them before adding. The streusel topping insures that they look gorgeous and adds an extra layer of flavor. There are walnuts in them to so you get some really great nutrients from the fruit and nuts. Not much guilt in eating one of these treats! You swapped the white sugar for coconut palm sugar which is very low as far as raising blood sugar. I did add an extra 2 tbsp. of milk because of the coconut palm sugar. They come out slightly darker if you use that special sugar. This batch was made with the coconut palm sugar. Don’t they look yummy? 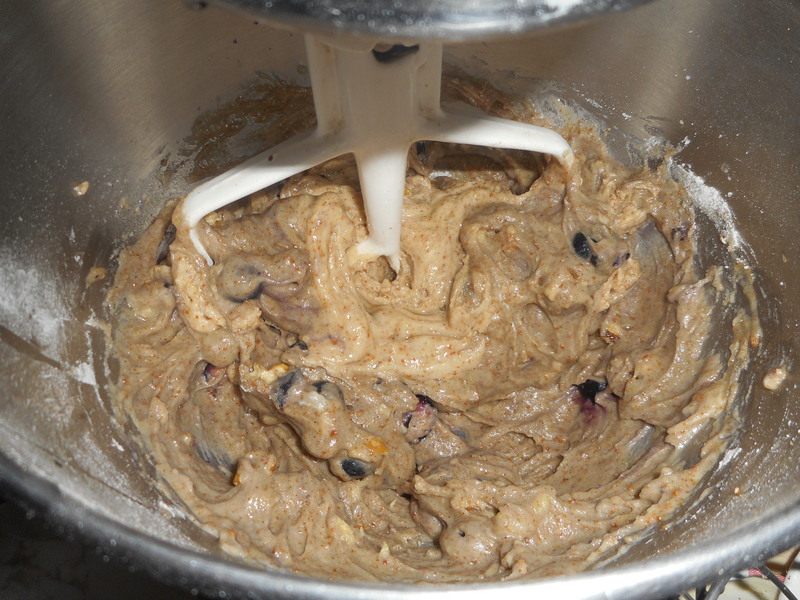 I took a few snaps as I made the batter. I warmed my cold eggs in a bowl of warm tap water; took only a couple minutes to bring them close from icy cold to room temp. Great if you forget to get out the eggs early for warming up on the counter. 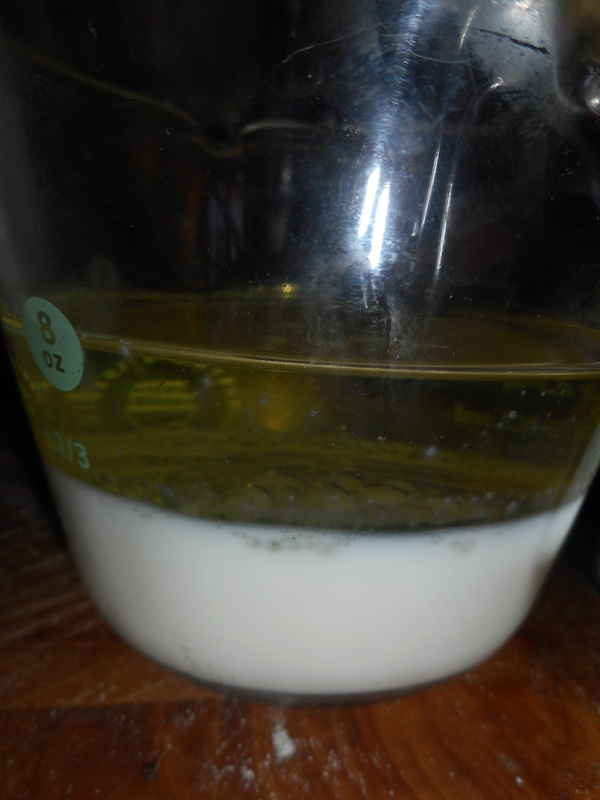 In a second photograph I show how I pour the milk in a glass measuring cup and add the canola oil right on top. 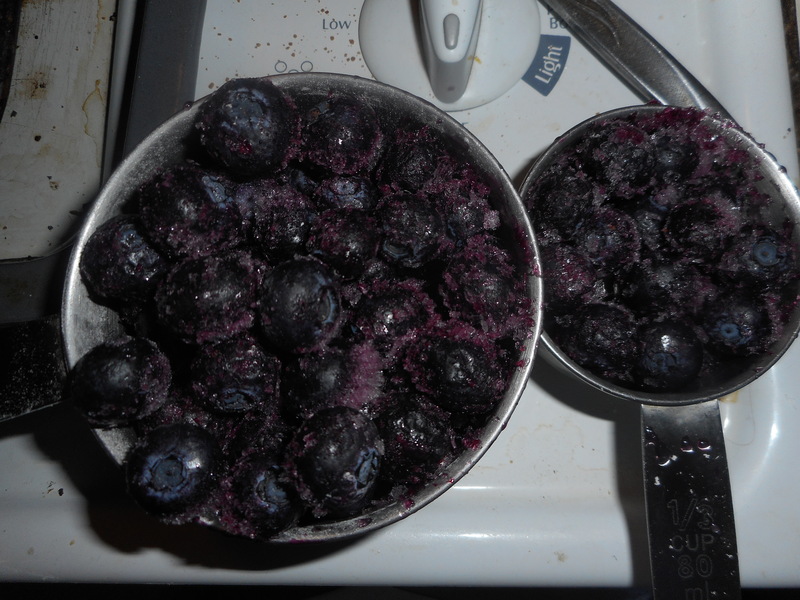 And the third shot is of the frozen blueberries before mixing in, don’t defrost them! 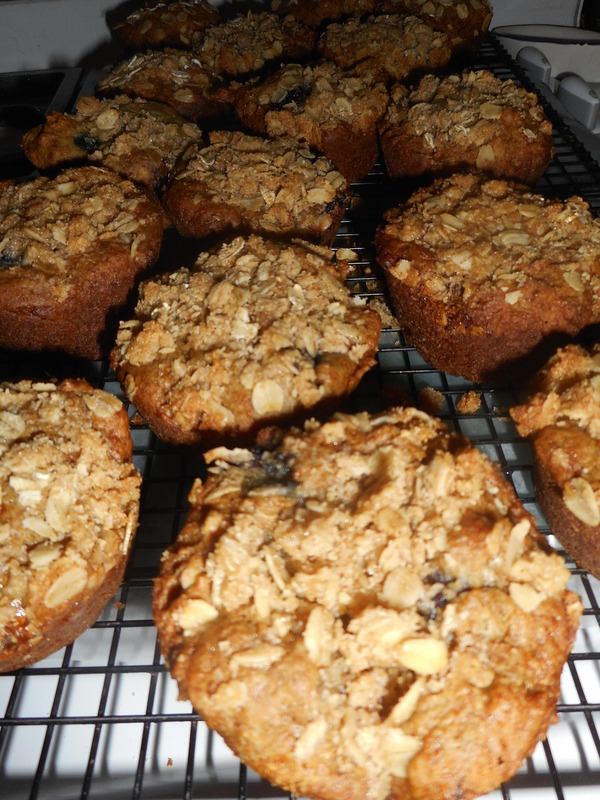 Finally; do make the streusel topping before you mix up the batter as that batter goes together in a few moments so have your topping ready to press into the batter in the muffin tins. I love how healthy these muffins are and the envious looks people give me when I chow down on one as they eat some snack full of preservatives, sugar and who knows what. People are envying ME and my GF treat…Love how being gluten free can be so yummy and easy when you plan ahead and bake your own snack treats. I freeze those I won’t eat in two days time; a zip lock freezer bag works great. Directions: Heat your oven to 375 degrees, placing the rack in middle of oven. 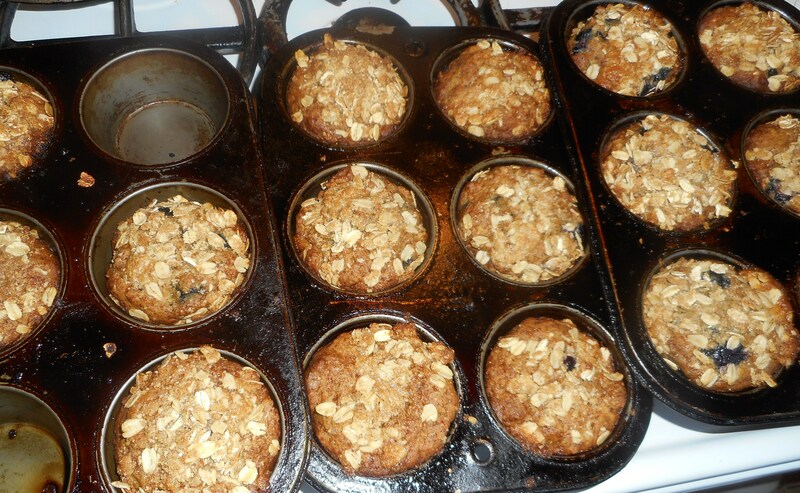 Spray muffin pans with cooking spray. One batch makes 14-16 muffins. I got 16 when I made them. Fill muffin pans 2/3 full. I use a big metal serving spoon and fill it about half way to dump in each muffin space. Sprinkle the top with the topping. Press it in a bit so it won’t all flake off after baking. Bake 21-23 min until golden brown. Do not over bake or they will taste dry. Remove immediately from the pans and cool on a rack. They freeze well for a few weeks, if they last that long. Keeps in fridge (well wrapped) or an airtight cookie jar for 2-3 days. Aldi’s Has Lots of Gluten Free Foods! Aldi’s has a lot of gluten free products these days. I hear they come and go on a monthly basis. I tried a few about a year ago and when I wrote Aldi’s to say thank you for something gluten free the response said that they couldn’t promise that these products will stick around. Well, they have. I think this is due to all of us gf types buying them on a consistent basis. Some of my Aldi favorites are the gluten free frozen sandwich pockets, particularly the pepperoni pizza ones. Really flavorful and tasty, they are my go to instant work lunch when paired with a dish of fruity yogurt. I like the southwest veggie ones but not nearly as much. Aldi’s makes a tasty multigrain cracker, in several flavors. My favorite is the sea salt multi-seed snack crackers; great crunch and a good flavor to match with a chunk of sharp cheddar. I had tried them the first time around and was very excited to find them again. I like their big bars of dark chocolate; some are marked GF on the wrapping; made in Germany and good quality for the price. The store brand gf pizza mix is decent, I made it kinda thick. Thin it is supposed to make two small pizzas. Worth trying again. Ditto as to their pasta; worth trying: great prices for both items. Their chocolate snack bars are rather tasty if small; that is a yes vote! I was less impressed with the frozen chicken nuggets, gf and fully cooked. I have eaten them 2 or 3 times. Small, lacking in texture or flavor and rather dry. I have to dip them in spicy bbq sauce to enjoy them. I would rather make my own from fresh raw chicken and bread crumbs. The gf vegetable lasagna is edible but not particularly fresh tasting with a bland watery tomato sauce. Nothing to compare with homemade but if you need a quick meal that you don’t have to make, it will do. I heard they have ravioli; not found any yet. I found pictures on line. Now I got to find it in the freezer case. Nor have I eaten any bread from Aldi’s. Heard good and bad about that. And they have small pizzas in the freezer: three items I must try soon! I didn’t use to be a fan of Aldi’s but you can’t beat their prices and as I said above, some of their products are pretty tasty. Get thee to Aldi’s if you want gf food at reasonable choices.